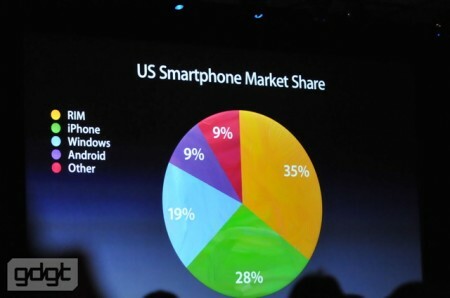 Apple CEO Steve Jobs shows the data on iPhone smartphone market share in his iPhone 4 & iOS4 Keynote WWDC 2010. In the US Apple iPhone is catching up to RIM Blackberry, while having a much larger lead on Android, at 3x the lead over Android. Even the awful Windows Mobile (WiMP) has a larger market share than Android (no wonder, as the Android “best” phones including the kludge Droid and Nexus One). This entry was posted on Monday, June 7th, 2010 at 3:46 pm	and is filed under iPhone. You can follow any responses to this entry through the RSS 2.0 feed.